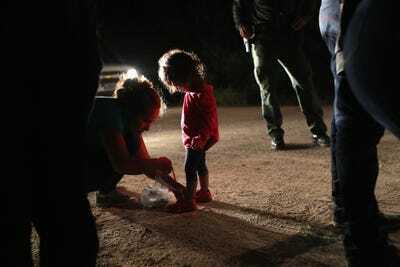 John Moore/Getty ImagesA Honduran mother removes her two-year-old daughter’s shoe laces, as required by U.S. Border Patrol agents, after being detained near the U.S.-Mexico border on June 12, 2018 in McAllen, Texas. The asylum seekers had rafted across the Rio Grande from Mexico and were detained by federal authorities before being sent to a processing center for possible separation. Most Republicans have been silent on the Trump administration’s practice of separating parents and children at the border. Their silence is immoral and ensures that the administration has enough political cover to continue doing what they are doing. In the last few days, however, several prominent Republicans have spoken out, led by former first lady Laura Bush. Only time will tell if others will follow suit. Last week, I wrote on how Republicans stood largely silent as the leader of their party condoned a practice as abhorrent as it is disappointing. Over the Father’s Day weekend, we saw a sea change in how Republicans reacted to separation of parents and children occurring at the border. And it was led by a former first lady from whom our current first lady could learn a thing or two. On Sunday, Laura Bush wrote an op-ed in The Washington Post condemning the situation at the border in the starkest of terms. Republican Sens. Susan Collins and Jeff Flake have similarly spoken out, as did Sens. James Lankford and Lindsey Graham.Sen. Ben Sasse, a Republican from Nebraska, was clear and direct. “Family separation is wicked. … It is harmful to kids and absolutely should NOT be the default U.S. policy. Americans are better than this,” he wrote. Laura Bush mentioned the incredible and astonishing actions of her recently deceased mother-in-law, who was also first lady. Barbara Bush had visited a home where children with HIV/AIDS had been housed. Much less was known about the disease at the time, and the stigma was much higher than it is now. Barbara was unafraid, her daughter-in-law wrote. “During her visit, Barbara – who was the first lady at the time – picked up a fussy, dying baby named Donovan and snuggled him against her shoulder to soothe him,” Laura wrote. Melania Trump has done nothing nearly as powerful. While her communications director did say that she “hates to see children separated from their families,” Melania has done and said little else. It’s true that she never asked for this platform, and no one voted her into office. But the country would be well served if she would take a cue from the women who preceded her.